High-fructose corn syrup has become well-known through the media recently as a contributor to obesity. And now, a study conducted at the University of Southern California has linked countries that consume large quantities of high-fructose corn syrup to higher rates of Type 2 diabetes. The study concluded that countries that are in the category with the most high-fructose corn syrup (HFCS) in their food supply had a 20% higher rate of diabetes. That statistic was entirely independent of total sugar intake and obesity rates. It further hammers home the notion that HFCS is a major public health problem—particularly in North America, but also around the world. Of the 42 countries studied, the U.S. consumed the most HFCS at 25 kilograms (55 pounds) per capita per year. Hungary was next at 16 kilograms (46 pounds). Canada, Slovakia, Bulgaria, Belgium, Argentina, Korea, Japan, and Mexico were also considered high HFCS consumers. The lowest category—countries in which the people consumed less than 0.5 kilograms of HFCS per capita per year—included Australia, China, Denmark, France, India, Ireland, Italy, Sweden, the U.K., and Uruguay. Those countries in the highest category of average HFCS consumption recorded an average rate of diabetes of 8.0%. This compared to 6.7% for countries in the lowest category. Fructose and glucose are both found in ordinary sugar (sucrose) in equal amounts, but HFCS has a greater proportion of fructose. The higher fructose content makes HFCS sweeter and makes processed foods more stable and look better. In North America, it is also far cheaper than other sweeteners because of the massive domestic production of corn. While no processed food is an ideal addition to any diet, those with HFCS have been linked to far more health problems than those that do not contain it. The food industry is not required to disclose HFCS amounts on nutrition labels, and can include it as “sugar.” But, the body breaks down fructose differently than glucose. 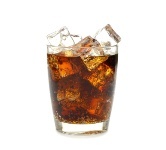 All sugar metabolizes primarily in the liver, where it can be quickly turned to fat. And, fructose has shown to be more likely to become fat than glucose. A related, and rapidly increasing, condition in North American is non-alcoholic fatty liver disease. Even if North Americans did not consume more sugar than they did a generation ago, the higher proportion of fructose as compared to glucose would have far worse effects on overall health. After a number of studies linked trans fats to health problems, there was a public outcry against them, and many jurisdictions have limited their use or banned them altogether. Many believe that HFCS belongs in the same category. Goran, M., Ulijaszek, S. and Ventura, E., “High fructose corn syrup and diabetes prevalence: A global perspective.” Global Public Health. Published online November 27, 2012.